I feel I’ve been a bit remiss in not doing a review on the traditional kiwi favourite of a Fish’n’Chip shop – these are usually small, family run businesses. Most neighbourhoods have a handful of Fish’n’Chip shops to choose from, and they usually offer more that just fish and chips. Often they have a selection of hamburgers and other deep-fried parcels of fat. Some even branch out into Chinese style food and in some cases Indian samosas. Unfortunately, the food is usually very cheap which isn’t helping our increasingly obese population to slim down. As we are vegetarian, most Fish’n’Chip shops usually offer a limited number of vegetarian friendly options, so long as you aren’t fussy about it being cooked in the same oil as the fish. 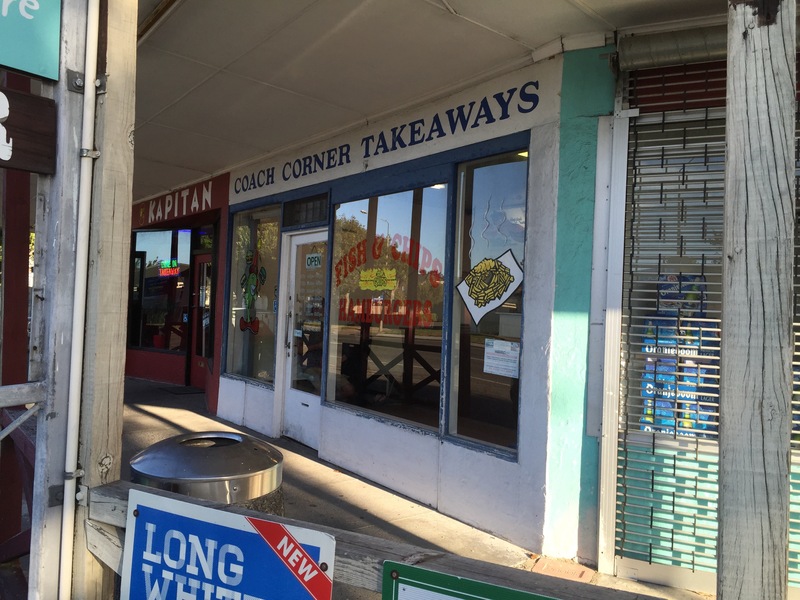 Our great local Fish’n’Chip shop went post quake and we tried a few others until we found the Coach Corner Takeaways location to be our preferred one for vegetarian burgers. So Friday night, Good Friday on Easter weekend, a public holiday, when most shops are closed except for restaurant and cafes (who often charge a public holiday surcharge) and takeaways shops, being some of the few places open. We decided to grab a quick, takeaway meal. There is no dine-in here, just a few seats to wait while your food is being prepared. 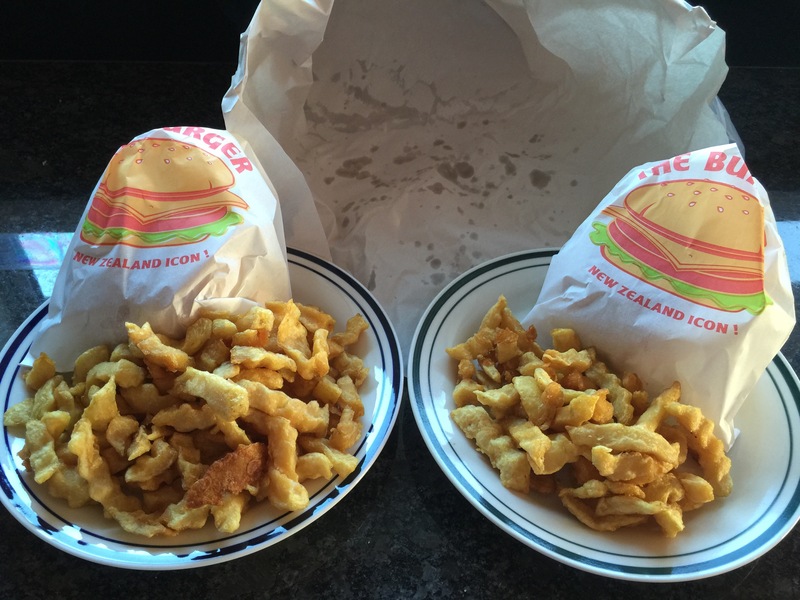 To save the wait, we placed our order on the phone – two Vegetarian Burgers with Egg and a scoop of chips – $11.80. They call the Vegetarian Burgers the “Friday Special” on the menu at this particular shop. Our order was ready pretty much the minute I walked in the door, about 10 minutes after placing our call. I paid and left. 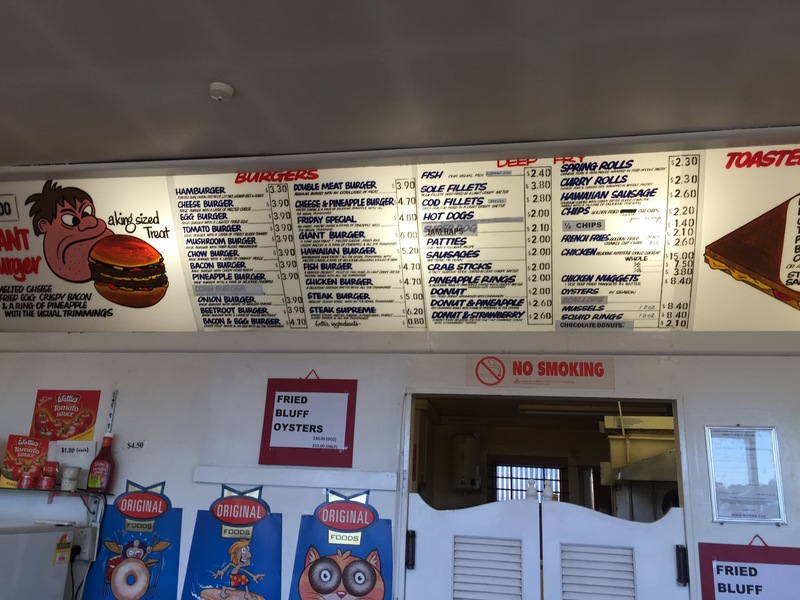 If you can read the menu, they have a large selection of burgers as well as a range of deep-fried foods and this particular takeaway offers toasted sandwiches. Do not come here if you are watching your weight or after gourmet food! This is good, solid fast food and makes McDonald’s burgers look like complete phony’s in the burger stakes. So back home I went. Two Vegetarian Burgers with Egg and a scoop of chips served up onto two plates – we were obviously being a bit fancy, as its social acceptable to eat off the paper and save on the washing up. As is customary for serving with these types of meals, our condiment of choice was tomato sauce (or as its known in other countries, Ketchup). 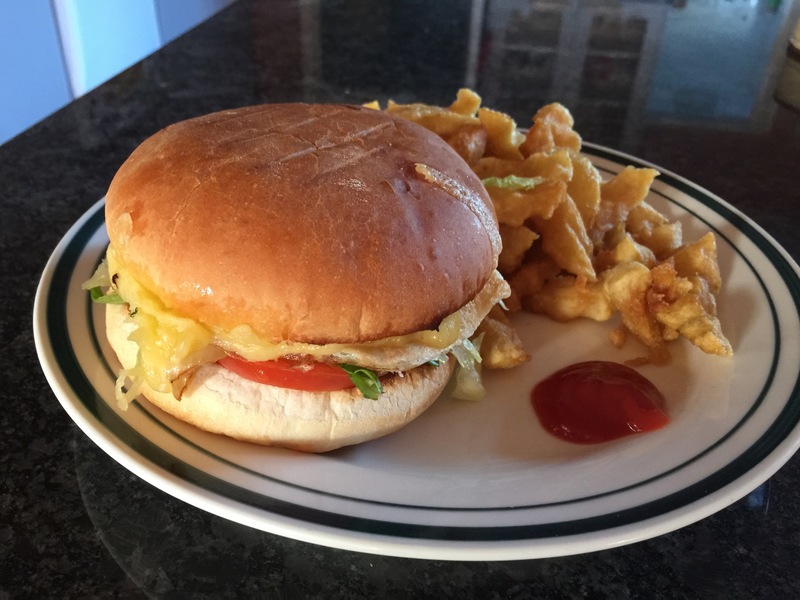 The filling for these vegetarian burgers was a fried egg, a pineapple ring, sliced tomato, sliced pickled beetroot (again customary in New Zealand and Australia), lettuce, onion, tomato sauce and cheese. The chips at this particular shop were crinkle cut chips. Would we come back here again? Yes, its cheap and quick. My partner is much more of a fan than I am. Would we recommend Coach Corner Takeaways? Maybe – it’s not at good favourite takeaways shop but its the best we’ve found in the area so far.